At IFA 2015, Samsung teased a new product called as the Samsung Galaxy View and based on that teaser something big in tablet was expected. 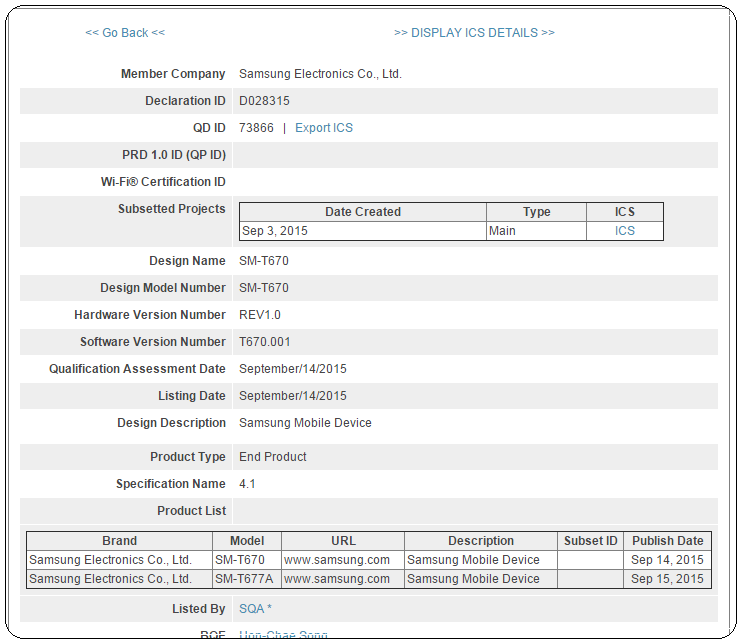 As rumored, Samsung’s unannounced tablet with model number SM-T670 was spotted passing through Bluetooth SIG certification and we might see display size of 18.4 inches. That’s One and a half time the iPad Pro in competition, yet we would like to call it as iPad Pro alternative because 12.9 inches is also very large for a tablet. In the age of tablets where there is no bar, people are preferring different size options. I am not sure of why would people prefer to go with 18.4 inch display or even 13 inch display on a tablet, which is a handheld device. Our laptops mostly have 15.6 inch display, 18.4 inch is too huge, atleast for me. According to earlier rumors, the tablet will be out with TFT LCD display with full HD resolution and powered with Octa core Exynos 7580 64 bit processor with 2 Gigs of RAM, 32 Gigs of internal storage and a micro SD card slot supporting storage up to 128 GB in size. It will extract juice from 5700 mAh battery and runs on Android 5.1 Lollipop with TouchWiz UI. It will not be a surprise if this gets Android 6.0 Marshmallow update, early next year.